The long road to Looneyville ..
.. begins with the first step across the L-28 canal bridge! Looneyville is a very small hamlet spread out in a small section of the Addition Lands in the Big Cypress National Preserve. It’s a catchy name, and while I haven’t (yet) met the villagers, they probably really aren’t any more loony than you nor I. Apparently the name comes from Roy Looney who sold off land parcels over the years and thereby creating “Looneyville“. This hike started just south of the Seminole Indian Reservation land (a restricted area). This day hike was organized by the Happy Hoofers chapter of the Florida Trail Association, a great group of cool folks from all backgrounds interested in hiking and exploring South Florida’s many wild and off-beat places. Aerial birds-eye view of hikers in Big Cypress National Preserve. This section of Big Cypress, the so called “Addition Lands” (acquired in 1988 & 1996) is and feels very remote. This is mostly due to the simple fact that because of a lack of a management plan, it has been off-limits to everybody except the residents of Looneyville and the ocassional hikers. There has been a lot of controversy regarding a forthcoming General Management Plan, as to who is going to get access and how . We should not forget that the Preserve was created only forty years ago only with the combined efforts of enviromentalists, hunters, conservationists, ORV users, hikers and others who wanted this land set aside and be protected. Prior to the Preserve, a giant international airport was already being built (a training runway survives to this day). Developers had plans to pretty much pave over from coast to coast in South Florida, and surely they could have done it had the Preserve not been established! Big Cypress is also vitally important to neighboring Everglades National Park. 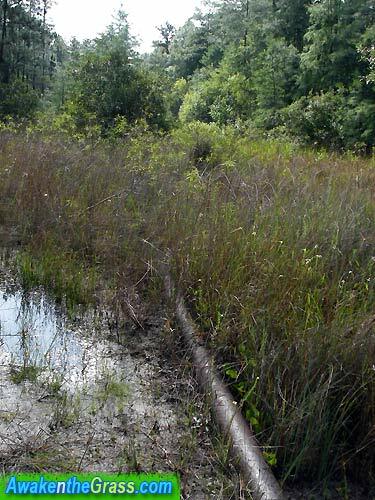 We came across a small pipeline maybe 4″ diameter..
It’s not surprising to see oil drilling pads, machinery or pipelines in Big Cypress Preserve – that’s one of the many special uses allowed under the original mandate. This could just be an old abandoned line, however seeing this small pipeline really makes you wonder what’s worth it and at what cost? How much natural gas or oil can a pipe like this really provide? Elevated view of group and pipeline in Big Cypress Addition Lands. Trail got thick pretty quick .. real fun going in a few sections! The slightly higher elevation of Big Cypress Addition Lands includes a nice mix of Pines and Cypress. Sometimes it’s nice to stop and admire the flowers for a second. Mushroom sprouting up in Big Cypress. Hikers in Big Cypress Addition Lands – a squirrel’s-eye view. Watch your step – lots of ant hills in this country! Woodpecker’s-eye view, hiking in the Addition Lands in Big Cypress. There is much beauty in the details in Big Cypress! These photographs are available through AwakentheGrass ART .. check them out! Gorgeous black and white version makes a great print – AwakentheGrass ART. A Desaturated Aerial hiking through Big Cypress – AwakentheGrass ART. The light can be just beautiful ! “Silver Frond” – AwkentheGrass ART. There are many of these man made “rock ponds” throughout the Big Cypress. They probably make good gator holes! All of a sudden we came up to a clearing “The Last Resort”. I don’t know if it’s a resort, but we were really glad to have a snack in the shade..
“The Last Resort” kindly provided us with shade for lunch and some good conversation. We were thankful for the rest in the shade! Moving on, the trails in the Addition Lands are a little bit of a time capsule .. The tires are “only” 40″ tall on this crusty rig! Abandoned old Toyota 4×4 in the jungle. Moving on .. now that’s what I’m talking about .. Welcome to the Jungle! I suppose one day all these abandoned vehicles, trailers and other remnants will be removed. Old Chevy van .. Bungle in the Jungle. The lichens are liking it! All green is all-right in black and white .. Here Yugo in Big Cypress! This trailer was probably my favorite – it just has this evil look to it! Bromeliad’s-eye view of abandoned trailer in them jungle woods ..
Oh what stories this trailer could tell .. Hiking along mostly old ORV trails in Big Cypress. The Shadows and the Wind .. in Big Cypress. Another rock pond with center island in Big Cypress Addition Lands. Water pools in ORV dirt tracks through soil compaction – much like dips in the highways that we’ve all experienced. Aerial view hiking along ORV trails in Big Cypress Addition Lands. Birds-eye view of flooded ORV trail in Big Cypress Addition Lands. This trail section was flooded but had a solid rock bottom so I walked down the middle of it. Trail back to the levee road. It was hot and humid, mid May, but this was a really fun day hike with lots to see! Beautiful buds in Big Cypress!! The Happy Hoofers in the shade off the levee road in Big Cypress Addition Lands. A BIG thanks to the Happy Hoofers – looking forward to many more hikes with ya’ll! Approximate “Looneyville” hike route through this small section of the Big Cypress Addition Lands. 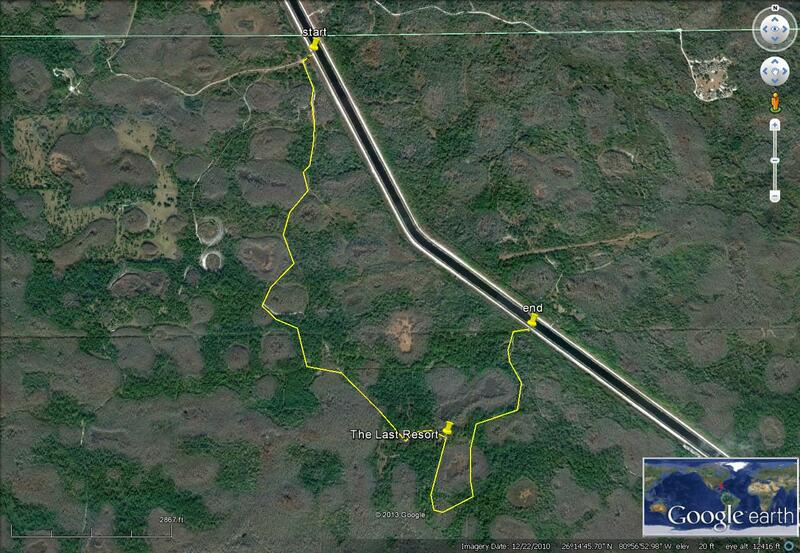 Hike in relation to Big Cypress is in the extreme NE corner of the Addition Lands.